Teaching profession is known for its sanctity and society building character. Hence people with good moral and dedication to contribute were preferring teaching profession in earlier time and they were deriving immense happiness in teaching profession. In recent years, this trend has been disturbed. Although not all, people with calculative mind are entering into this profession as they feel the work load will be much lesser as compared to any other profession. Similarly, most of the students in recent years take admission in higher education for the sake of the degree or diploma without looking into value addition in them. The connotation of 'happiness' for the teachers has not been the same. Earlier, teachers were becoming happy as they succeed in clarifying students' doubts on or off the class timings. But in recent time, most of the teachers feel happy when they restrict their teaching to manage the class timings, students don't disturb during off-class timings, they avail more number of off-days, leaves and class suspensions. In fact, such teachers derive happiness from negativity in teaching profession - becoming very particular with respect to their rights but forget their responsibilities. At the same time, there are also teachers with values who are still considering teaching as noble profession and derive happiness with all sincerity. With this backdrop, this Paper is prepared to present both normative and positive side of teaching profession. For the purpose, selected higher educational institutions of Odisha and Jharkhand have been picked up. The study is a blend of qualitative and quantitative research. While positive aspects of happiness in teaching profession have been ascertained by way of in-depth interview and observation methods, the normative aspects have been benchmarked through existing literature review followed by focused group discussions. It's found that there is wide gap between positive and normative aspects of happiness in teaching profession, in recent years. The plan of the Paper is as follows. Section-2 of the Paper explains the Model of Happiness and identified Gap. Objective and Methodology of the Paper is presented in Section-3. Normative aspects of happiness in teaching profession are contained in Section-4. Section-5 presents the positive aspects of happiness in teaching profession. Conclusion of the Study is presented in Scetion-6. Very commonly used Model of Happiness is the PREMA Model (Seligman, 2011). PERMA is the descriptor for the five essential building parameters of well-being and happiness. Those are; Positive emotion (Feeling Good), Engagement (Finding Flow), Relations (Authentic Connections), Meaning (Purposeful Existence and Achievement (A Sense of Accomplishment). This building block of the model is a most important linkage to happiness. It is the power to be upbeat and have the positive perspective on the past, present, and future. This positive perspective of life can help anybody in relationships, work, and inspire him/her to be more 58 creative and take more chances. In everyone's life, there are highs and lows, in stead of focusing on the lows that increase the chances of developing depression one should focus on the high and positive aspects of life. There are also multiple health benefits inherent in positive emotions. For a teacher, becoming creative and having alternative solutions to any situation are a must. For this, s/he must have that positive emotion which will be reflected in the students' satisfaction and performance. Optimism with a teacher helps his/her students develop 'never give-up attitude'. With this attitude, the students in the front line can excel like anything and students in the back-benches will have a ray of hope to overcome their bottlenecks. Consequently, the teacher will be happy as his/her positivity will take a shape of in the form of the students' performance. Finding activities for full engagement is vital for one's happiness as it make him/her to learn, grow and nurture his/her happiness. Everyone is different and we all need something in our lives that completely absorbs us into the present moment. A true teacher, particularly in higher education, is as such fully engaged with teaching and allied activities such as Question Paper Setting, Evaluation, Research in the form of writing articles, Presenting Papers in national and international Seminars and Conferences. Besides, in current scenario, teachers are also engaged in institution building activities. Human life without any relationship is lifeless. Most important aspect of life is relationships and social connections. Thriving on love, connection, intimacy, and a brawny physical and emotional interaction, human beings build up the society. with other humans. Through positive relationships with your near and dear ones, individuals spread love and get the happiness. It is only strong relationships that gives support in difficult times. For a teacher, while having relationships among his/her near and dear ones gives personal happiness, connecting to students and helping them out in the need of the hour, results in professional happiness. Happiness is nothing but realization of one's existence. If anybody is well aware of his/her presence in the world and knows the purpose of his/her creation, s/he will easily overcome all odds and have the happiness in the fist. To become more satisfied and happier by enjoying the tasks, one has to realize the greater impact of one's work and why one chooses the pursuit. If a teacher understands the purpose of his/her existence as a teacher, teaching becomes excellent so also learning. At the same time, to become happier, teachers should also be particular about the purpose of their students. Goals and aspirations in life are must for any sane individual. Through goals and ambition, one can achieve things that can give him/her a sense of accomplishment, provided s/he puts the required efforts in right direction. In order to be happy, goals and ambition need to be achieved. For that one should make realistic goals that can be met. Just putting in the effort to achieving those goals, pending the result, gives a sense of satisfaction and when one finally achieves those goals, a sense of pride and fulfillment is attained. Having accomplishments in life is essential to thrust ourselves to grow and flourish. Although existing literature speaks about PREMA Model of Happiness and its implementation in different walks of life, implementation of the same in teaching profession has not been a point of attraction for the researchers. But the Model has every requisite to be fitted to teaching profession as well. Considering this, the present study is thought of. Following are the Objectives of this study. For the purpose, four higher educational institutions (HEIs) of Jharkhand and Odisha have been selected as per the convenient sampling method. Different stakeholders of selected HEIs such as teachers (faculty members), students and Management representatives. Number of teachers considered is 20, number of students considered is 50, number of representatives of Management considered is 15 and number of established veteran teachers of the society (not from the selected HEIs) considered is 10. To ascertain how the teachers (of higher educational institutions of India) should be happy in professional front - Normative aspect (Ideal State of Affairs), existing literature have been studied and two focused group discussions (FGDs) have been conducted with 10 established veteran teachers (5 for each FGD). Three more FGDs have been conducted among Management representatives and view points of 50 students have also been collated. To be happy, a teacher must be effective. An effective teacher, as ascertained through existing literature review, FGDs and view points, should have the following traits. A teacher in Indian higher education should be happy if the taught are getting best out of him/her and gain valueaddition to be place-able. Two Systems that make the teaching of a teacher effective are Learning Management System (LMS) and Outcomes-based teaching and learning (OBTL). Learning Management System (LMS) or e-learning is an arrangement that implant hi-tech innovations within the learning environment. It is a system that uses internet technology for delivering information to students with interactions through computer interfaces. It is designed to be used in different educational processes to improve the performance of learning. It may be used in many forms, i.e. as an add-on to conventional lectures, asynchronous distance learning, learning management systems or online learning. The LMS is comprehensive package of creating content, delivering content, monitoring student participation, assessing student performance and grading. Mostly LMSs are web-based and facilitate access to learning content and administration. As teachers create courses within a Learning Management System, they have the opportunity to post assignments, monitor student progress and work, post content (videos, documents, links, and more), and to flip their classrooms. LMS in India is basically intended for distance education programs wherein the students get deprived of classroom deliveries of faculty members. But to make the teachinglearning effective, there is the need of incorporating LMS in Classroom teaching-learning System. The combination of traditional learning (face-to-face lectures) and webbased courses is known as “blended learning”. This mixes the features of virtual and real environments to provide a holistic information production and enhance the students' learning experience. Incorporation of LMS by educational institutions will enhance and support classroom teaching and offer courses to a larger population of learners. HEIs across globe use LMSs to deliver online courses and augment on-campus courses. In India, the use of LMSs is primarily confined to online courses only. However, off late, a few advanced HEIs have used the same in their oncampus programs in order to improve the quality of teaching-learning process. It helps in enhancing performance through tracking and reporting tools. It allows users to be evaluated before they take the course, while they are in the course, and when they finish the course. The content and information in the course can be easily upgraded. It simplifies the learning process as the students can access the contents of the sessions beforehand if they access internet. OBTL is focused not on what the teacher intends to teach but rather the emphasis is on what is the outcome from the learner of that teaching is intended to be. Detailed, wellwritten learning outcomes or competence descriptors allow both teaching staff and learners to have a clear picture of the behaviour that is expected of the latter at the end of a course. This can help to provide direction and stability in the course, and can also help to guard against over-reliance on a particular staff member or distinctive interpretation of syllabuses. It is, of course, strongly recommended that the students should always be included in this pre-knowledge of objectives. All too often in the past, their only clue as to what was required of them came from a study of previous exam papers - a situation that is difficult to defend, since students have quite enough problems to face without being involved in academic 'guessing games'. Outcome expected / Learning Outcome should be prepared at three levels – for the Program (Ex. MBA, BBA, B. Tech. etc. ), for the Course (Ex. Quantitative Methods, Marketing Management, etc.) and for each Session. At teachers' level, the outcome expected from the students may be sketched at two levels – Outcome expected at the end of each session and Outcome expected from the Course on completion of the Course. But Outcome expected on completion of the Program will be prepared by the Deans/Principals of the Faculties. While the teachers prepare the Outcome sheet, they need to consider the background of the students, constraints imposed by the Academic Regulatory Bodies and the requirements of the Market. At the end of the Courses, students' feedback needs to be taken and the same is to be mapped with the outcome sheet. While designing the outcome expected from the program, top priority needs to be given to the requirements of the market. Having discussed how a teacher should be happy, it is pertinent to know how the teachers in recent time are becoming happy. Among 20 teachers studied, hardly four teachers (20%) do possess the traits required to be an effective teacher and do adapt themselves to changing environment very fast and as such they become happy, in true sense. 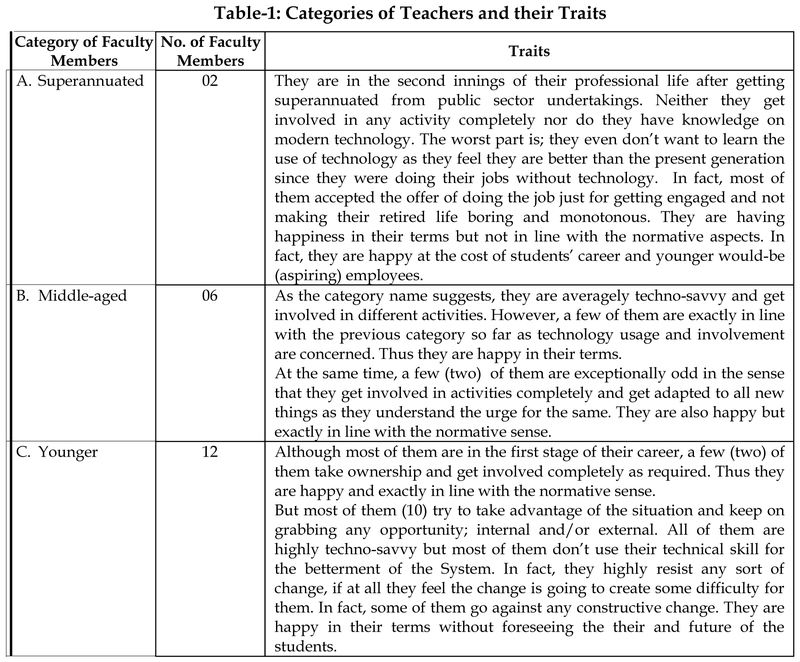 Remaining 80% of the teachers feel to be happy amidst many odds in them as presented in Table-1. Happiness is an integral part of teaching profession. If a teacher does not enjoy the profession, neither s/he nor the students will be happy. Those who come to this profession by choice, they get happiness in true sense and as such there is no deviation between happiness in normative sense and positive sense. But the percentage of such teachers in Indian HEIs is very dismal. On the other hand, teachers who come to this occupation by chance also get the happiness for not doing their job what they are supposed to do. To have happiness in teaching profession, people should join it by choice and take the responsibility of the taught concerning their learning. PERMA Model should be practiced by each teacher in letter and spirit to have at least professional happiness. Once professional happiness is achieved, many odds in personal front will also be mitigated. Fredrickson, B. L. and Branigan, C. (2005) Positive emotions broaden the scope of attention andthought action repertoires, Cognition and emotion, 19, 2005, 313- 332. Gopalkrishnan, V. (2009) Determinants of job satisfaction of self-financing college teachers, Journal of Community Psychology and Research, 26(3), 2009, 300- 310. Ishwara, P. and Laxmana, P. (2008) Correlates of job satisfaction among teachers in selected universities in Karnataka state, Experiments in Education, 36(5), 2008, 11-19. Kaur, G. and Sidana, J. J. (2011) Job satisfaction of college teachers of Punjab with respect to area, gender and type of institution, Edutracks, 10(11), 2011, 27-35. Kumar, S. and Patnaik, P. S. (2004) A study of organizational commitment, attitude towards work and job satisfaction of postgraduate teachers, Journal of Educational Research and Extension, 41(2), 2004, 1-15. Mehrotra, A. (2005) Leadership styles of Principals, New Delhi: Mittal Publication. lPost, S. G. and Altruism, (2005) Happiness and Health: It's good to be good, International Journal of Behavioural Medicine, 12 (2), 2005, 66-77. Saha, K. (2013) Job Satisfaction of the Junior College Teachers of Assam in relation to Some Selected Variables, The CTE Journal, XI (1), 2013, 120-124. Sridevi, K. V. (2011) Job satisfaction of teacher educators of University of Mysore, Edusearch: Journal of Educational Research, 20(1), 2011, 59-65. Seligman, M. E. P. (2012) Flourish: A Visionary New Understanding of Happiness and Well-being, Atria Books, USA. Swain, S. C. (2016) Acceptance and Efficiency of the Learning Management System in Campus-based Programs of Private Higher Education Institutes in India, Growth, Vol. 44, No. 3, PP. 1-7.